Organised by the Istanbul Foundation for Culture and Arts (IKSV) and sponsored by Garanti Bank for 22 years, the Istanbul Jazz Festival will once again host leading names and new discoveries from the world of jazz, as well as the stars of contemporary music between 29 June and 18 July 2019. The festival will feature more than 300 names in 27 different venues around Istanbul. The 26th Istanbul Jazz Festival will offer a festival experience full of discoveries in June and July with more than 50 concerts featuring veterans and new discoveries of jazz, well-known ensembles and new horizons of contemporary music. Following the success of the editions in 2017 and 2018, the festival will once again organise Vitrin: Showcase for Contemporary Music from Turkey that supports successful musicians and ensembles of the local scene in their global outreach, with the sponsorship of SOCAR Turkey, on 3-6 July 2019. A group of international delegates composed of leading representatives of international music industry and journalists will explore contemporary music from Turkey together with the festival audience during the first four days of the festival. The free open-air event, Jazz in the Parks will go beyond its traditional venues Fenerbahçe Khalkedon and Fenerbahçe Park, and bring jazz music also to a newer park at the outskirts of Istanbul, Beylikdüzü Yaşam Vadisi Parkı on the European side of the city. For the first time this year, under the name of Ah Şu Cazlar Blues’lar, local and foreign brass bands and jazz ensembles will bring the energy of music to a park in Halıcıoğlu near the Golden Horn. One of the hallmarks of the festival, an over-night music marathon Night Out, on its 5th edition, will give the stages on the Asian side of the Bosphorus to the most promising independent artists of the local scene in 7 different venues. With the Vitrin Tour to be held for the first time this year, the jazz lovers will have the chance to listen to the different names of the local scene live on stage at three different places in Şişhane. The festival programme will also feature A Childlike Day with performances and workshops penned for children. One of the legends of the Istanbul Jazz Festival will come back this year. As one of the indispensable events in the festival history, Jazz Boat sails to Bosphorus, carrying the festival joy once again after 9 years. During the long-expected trip of the Jazz Boat, which was highly anticipated by festival audience for a long time, various jazz ensembles and DJ’s from Turkey and abroad will take the stage. The programme of the 26th Istanbul Jazz Festival was announced at a press meeting held on the evening of Monday, 25 March at Feriye. Speakers of the meeting were General Director of İKSV Görgün Taner, the Executive Vice President of Garanti Bank Didem Dinçer Başer and Istanbul Jazz Festival Director Harun İzer. Istanbul Jazz Festival Director Harun İzer presented the festival programme and events. The press meeting was also attended by well-known artists and jazz musicians from Turkey. Festival concerts will be held in different locations of the city, continuing to provide a whole new concert experience to the music lovers by turning unconventional spots into concert venues. Among the 27 venues that will host the festival this year are The Marmara Esma Sultan Mansion and Beykoz Kundura, which are unforgettable places in the history of the festival; and the garden of one of the oldest buildings in Beyoğlu, Palazzo di Venezio, which served as a festival venue for the first time last year. Other festival venues include Feriye and Cemiyet for the first time this year, and Nardis Jazz Bar, Volkswagen Arena, Sultan Park Swissôtel The Bosphorus, Sakıp Sabancı Museum the Seed, Zorlu PSM Turkcell Platinum Stage, UNIQ Open Air Theatre, UNIQ Hall, Fenerbahçe Khalkedon, Fenerbahçe Park, Beylikdüzü Yaşam Vadisi Park and Salon İKSV. Night Out programme will once again take place in Kadıköy’s most beloved venues: All Saints Moda Church, Bant Mag. Havuz / BİNA, Kadıköy Sahne, Kadıköy movie theatre, KargART, Mecra and Moda Sahnesi. Unquestionably one of Istanbul Jazz Festival’s most beloved events ever, the Jazz Boat is returning after nine years upon fan demand. Add the ferry tour to your schedule for this highly anticipated seafaring concert where a tour of the Bosphorus meets with music, and the city’s impressive atmosphere mixes with melodies. The Jazz Boat will depart from Kabataş Pier, have a stopover at Anadolu Kavağı and return to Kabataş. Tickets for the 26th Istanbul Jazz Festival go on sale on Saturday, 13 April at 10.30 and are available from Biletix sales points, and also from the box office of İKSV (every day from 10.00-18.00 except Sunday), where tickes can be purchased without a service fee. The 26th Istanbul Jazz Festival’s Lifetime Achievement Award will be presented to two veteran names of jazz, Hasan Hürsever and Ömür Göksel at the festival’s opening ceremony. Drummer Hasan Hürsever began his musical studies in his hometown of Mitrovica, Kosovo. Hürsever, who came to Turkey from Yugoslavia stepped into his professional music career with the band “Kuyruklu Yıldızlar” and worked with many musicians including Atilla Şereftuğ, Özdemir Erdoğan, Ayten Alpman, Ali Kayral, Kayahan, Ümit Aksu, Esin Engin and Ayhan Yünkuş. He joined the TRT Big Band in 1980, founded by Süheyl Denizci. In 1987, he played with Fatih Erkoç, Neşet Ruacan and Ergun Eremkar in the International Pori Jazz Festival in Finland. After his retirement from TRT Big Band, Hürsever worked with pianist Şevket Uğurluer for many years. He continues his musical practice with his sons Hakan and Volkan Hürsever, who are pianist and double bass player respectively. Selected as “The Voice King of Turkey” at the age of 18, Ömür Göksel gained huge success and popularity despite his young age with his extensive repertoire and ability to sing in different languages. During the 1970’s, he won gold records multiple times with his songs like “Mutluluk” and “Sevemem Artık”. In 1979, he decided to continue his musical practice abroad after receiving concert offers from Europe and USA. After this date, he pursued his professional music career in Italy, USA and Germany. Having achieved great success with his albums such as "A Touch of Quality" and "A Touch of Love" in the 2000s, Göksel continued working on in this series in the following years. Göksel continues his musical activities and often gives concerts with TRT Big Band. Vitrin: Showcase for Contemporary Music from Turkey will be held for the third time this year under the sponsorship of SOCAR Turkey on 3-6 July 2019. The series will focus on the successful musicians and ensembles of the local scene and will aim to provide them with a new opportunity to reach a wider international audience. Vitrin: Showcase for Contemporary Music from Turkey, which builds on the objective of promoting the cultural values of our country and enhancing the intercultural dialogue, was developed as a project that focuses on jazz and contemporary music. The rapid development of music production in Turkey and the multitude of recently emerging musicians lead to new projects not only in Turkey but also in the international arena, receiving great interest and demand. This productive environment in the local music industry has motivated the Istanbul Jazz Festival, to offer an effective international platform for emerging artists. The series will feature more than 30 successful contemporary music and jazz artists and ensembles from Turkey. The concerts, to be held between 3-6 July, will be attended by prominent representatives of the international music industry, in addition to the festival audience. In parallel with these concerts, Turkey's contemporary music scene will be introduced to the international participants with panels and seminars. The sectoral meetings to be held will bring local and foreign music professionals together and establish relations that will encourage local artists to reach out to the international arena. One of the projects to be realised under Vitrin will be the SOCAR Turkey Silk Road Tour Support Award, worthy of 5,000 Euros which will be presented once again in order to support the international tours of the artists and bands participating in the programme. Vitrin will feature concerts of the piano virtuoso and composer Aydın Esen and his group Aydın Esen Group, the band consisting of Azeri, Iranian, Kurdish and Turkish musicians from different cultures and geographies No Land, guitarist, composer and producer from Istanbul who makes a difference in our music scene with his the talent he projects in his skilfully structured songs and electro-acoustic productions Efe Demiral “Uyku Pansiyon”, jazz vocalist Duru And, a composer and performer in different styles of various genres and one of the most known free improvisation musician and her band Gülşah Erol Band, the inventor of the adjustable microtonal guitar Tolgahan Çoğulu and bağlama player Sinan Ayyıldız, known as one of Turkey's most important drummer Turgut Alp Bekoğlu Love Jazz Quartet and trumpeter Barış Demirel – Barıştık Mı. Some of the most exciting and alternative names of the independent scene such as Gaye Su Akyol, Eda and Big Band, Cava Grande, Elz & The Cult, Ah! Kosmos and The Kites give concerts in various venues in Kadıköy and Moda within the scope of Night Out event. The detailed programme and the complete list of artists included in Vitrin will be announced in May. This year the 26th Istanbul Jazz Festival opens with a magnificent night yet again. Ömür Göksel, one of Turkey’s most prominent jazz singers who left his mark on the 1960s and 70s with his Golden Record Award-winning songs “Mutluluk”, “Sevemem Artık” and “Yanıyorum”, and master jazz drummer Hasan Hürsever will be presented with Lifetime Achievement Awards. Afterwards, Hasan Gürsever will be performing a mini-concert with his trio consisting of his sons Volkan and Hakan Gürsever, and leave the stage to the Balkan Paradise Orchestra. The band consisting of nine Barcelonian female musicians was founded in 2015 with the inspiration they drew from Balkan music. The synergy created by the trumpet, clarinet, trombone, French horn, tuba, percussion and drums turns every performance by the Balkan Paradise Orchestra into a musical feast. The night promises breathtaking hours of joyous polyphony music. The festival will once again organise a special event for children. On 13 July, at 14.30, children will spend an eventful Saturday when they have fun as they discover their musical leanings through concerts, workshops, training programs, and exhibitions, the details of which will be announced soon. The festival will be speaking to children on this dreamy day full of music with concerts designed for children, workshops and performances. Held for the third time, this year’s A Childlike Day will be an unforgettable day for children with its programme that includes Yürüyen Merdiven and Tülay Günal’s performance “The Story of Stories”. The programme for the creative workshop, which will be open to ticket holders by making a reservation, is due to be announced later. This year, a children’s book will be published within the scope of the 26th Istanbul Jazz Festival with the support of Bernard Van Leer Foundation. Within the scope of the project, the children’s book under the editorship of Burcu Ural Kopan for İKSV festivals and biennials will decribe jazz music to the children through the seven colors of the rainbow and there will be a reading section, as well as puzzles, practical activities, games in each section of the book. In addition, each section will introduce a jazz musician and will include a playlist of related topics. The children’s book, which Prof Feyza Çorapçı from Boğaziçi University, Department of Psychology supports as an academic advisor, will be published in Turkish, English, and Arabic, and will be accessible free of charge at event venues as well as several bookshops. In addition, workshops related to the book will be organised at various festival venues during the festival and at the İKSV Alt Kat: Learning and Interaction Space. The children’s book of the Istanbul Jazz Festival is being prepared within the scope of Early Childhood Development & Culture and Arts Project with the support of Bernard van Leer Foundation. The project that will continue until the end of 2019, also involves special events, readings, workshops, various trainings, seminars and meetings. In cooperation with the Istanbul Jazz Festival and İKSV Alt Kat, and with the support of the Istanbul Development Agency (İSTKA), the festival organises Children’s Workshop Design Programme for musicians interested in working together with children. The accomplished musicians with a desire to work together with children will design workshops for children of various age groups to raise their interest in music, to improve their sense of rhythm, and to promote their creativity. The 8 participating musicians will have the opportunity to attend “Seminars for Supporting Learning Processes of Children and Youth at Culture and Arts Workshops” as well as master classes organised by Barış Karayazgan, art trainer at PACE Children’s Art Centre and Sophia Alexandersson, the founding head and art director of Sweden-based ShareMusic & Performing Arts. Alexandersson’s master class will be held with the valuable support of the Consulate General of Sweden in Istanbul. The workshop programmes of the musicians joining seminars and master classes will be revised by Prof Feyza Çorapçı from Boğaziçi University, Department of Psychology, Assoc Prof Sevil Akaygün from Boğaziçi University, Department of Mathematics and Science Education, İKSV Alt Kat and the Istanbul Jazz Festival. Young Jazz is being organised for the 17th time with the 26th Istanbul Jazz Festival. Young Jazz provides a platform for amateur or emerging musicians and bands to make their early professional stage appearance within the Istanbul Jazz Festival. Every year, the festival opens applications for young musicians from Turkey with interest in classical or contemporary forms of jazz, as well as jazz fusions such as rock, funk, Latin, pop, acid or electronic influenced forms of jazz, soul, R&B, or similar genres. The applicants are invited to submit demo recordings either of their original compositions, or covers of jazz standards or similar songs of their choice. Musicians and bands to take the stage at the Jazz in the Parks event within the festival are then selected by the Young Jazz Selection Committee. In addition, for the first time this year, the Istanbul Jazz Festival will present three workshops and master classes open to the participation of all musicians who apply the Young Jazz, with the support of Audioban in the scope of Young Jazz. At the office of Audioban, these trainings will be held between 10 and 26 May 2019, and will focus on Album Making Stages-Jazz Production, Stream / Digital Rights and Perfomance Practices and Staging. In addition to the trainings, the Istanbul Jazz Festival and Audioban will continue to collaborate with the groups that apply for the Young Jazz 2019 program. Audioban recently released the first album of the band The Kites, which was one of the teams that will be selected within the Young Jazz auditions in 2018 and will take the Istanbul Jazz Festival stage this year. The Young Jazz Selection Committee comprises musician Ayşe Tütüncü, musician Cenk Erdoğan, musician Ceyda Köybaşıoğlu, music writer Feridun Ertaşkan, musician Harun Tekin, music writer and producer Hülya Tunçağ, musician Volkan Öktem, journalist Yekta Kopan and Director of İstanbul Jazz Festival Harun İzer. 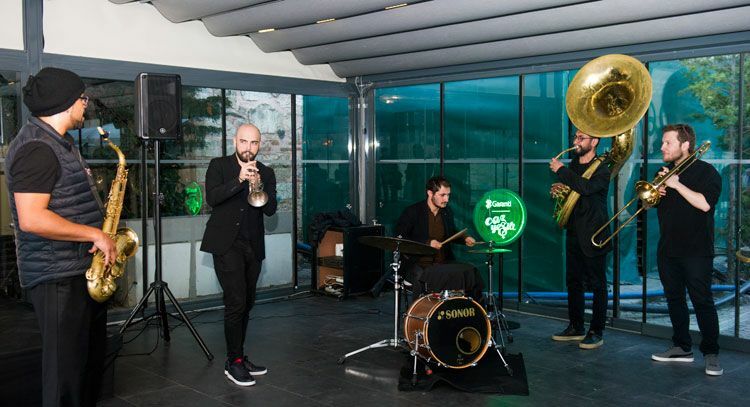 The 26th Istanbul Jazz Festival is organised with the support of the Festival Sponsor Garanti Bank as well as a number of different organisations. Vitrin Series Sponsor is SOCAR Turkey. Among the festival’s performance sponsors with the highest contribution are Birlikte Güzel and SOCAR Turkey. Automotive Sponsorship for the festival is provided by Volvo Car Turkey. Anadolu Efes, Clifford Chance, Yegin Ciftci Attorney Partnership and Mastercard also offer their support to the festival. Various concerts within the festival are organised with the contribution of US Embassy in Ankara, Austrian Culture Office, Italian Embassy, Institut Français Istanbul, Consulate General of Sweden, Goethe-Institut Istanbul, Consulate General of Israel, The UN Refugee Agency (UNHCR), Vehbi Koç Foundation and Sabancı Foundation. The 24th Istanbul Jazz Festival also receives support from the Ministry of Culture and Tourism, Istanbul Metropolitan Municipality, Beyoğlu Municipality, Beşiktaş Municipality, Kadıköy Municipality and Beylikdüzü Municipality. Vitrin: Showcase for Contemporary Music from Turkey is also supported by the Ministry of Culture and Tourism. The Founding Sponsor of the Istanbul Foundation for Culture and Arts is Eczacıbaşı Group, Official Hotel Sponsor The Marmara Collection, İKSVl Carrier is DHL, İKSV Insurance Sponsor is Zurich Turkey, Health Service Sponsor is American Hospital, and other service sponsors are Navitas, GFK, directComm Marketing Group, AGC Software and Loodos Tech. The festival campaign, created by the advertisement agency Büro for the 26th year of the festival, reflects the diversity of the festival’s programme with the slogan, #cazadokunaneller. The hands used in the campaign belong to jazz musicians Efe Demiral, Gülşah Erol, and Baturay Yarkın. The festival programme is announced on the official festival website, caz.iksv.org/en and the İKSV Mobil app. The İKSV Mobil app, sponsored by the Loodos Tech, has been redesigned for a better experience. You can create your own profile with newly added features and add your favourite events to your favourites and calendar. You can add the concerts you want to join within the Istanbul Jazz Festival to your calendar and make your own programme via the İKSV Mobil app, which can be downloaded from the AppStore or from Google Play.